- made from unravalled silk/viscose yarn (50 g /125 m.) - Size M.
87 sts .1 row (= a back row) stockinette sts. (it appears in front as purl). 1 edge stitch , then 14 x the pattern , 1 end loop . Repeat the height rapport 27 x times. For the armhole cast off as follows : 1 x 3, 1 x 2, 1 x 2, 1 x 1 sts. Then are still 75 sts. on the knitting needle. Knit another 12 height reports, then cast off for the neck 1 x 25, 2 x 2, sts. (= 33 sts. for neck ). Cast off and at the same time for the shoulders on both sides 2 x 7 , 1 x 6 sts. ( = 20 stitches for a shoulder) ( total height = 40 rapports ). Same knitting as the back. 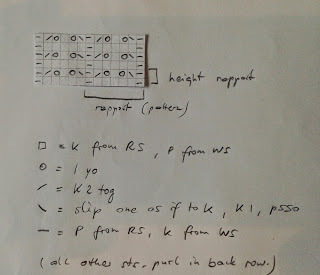 After 29 height rapports cast off for the neck 1 x 22, 1 x 3, 2 x 2, continuing with casting off 1 x 1 until you have 20 sts. on the knitting needle (per side). Cast off for the shoulders same way as the back. 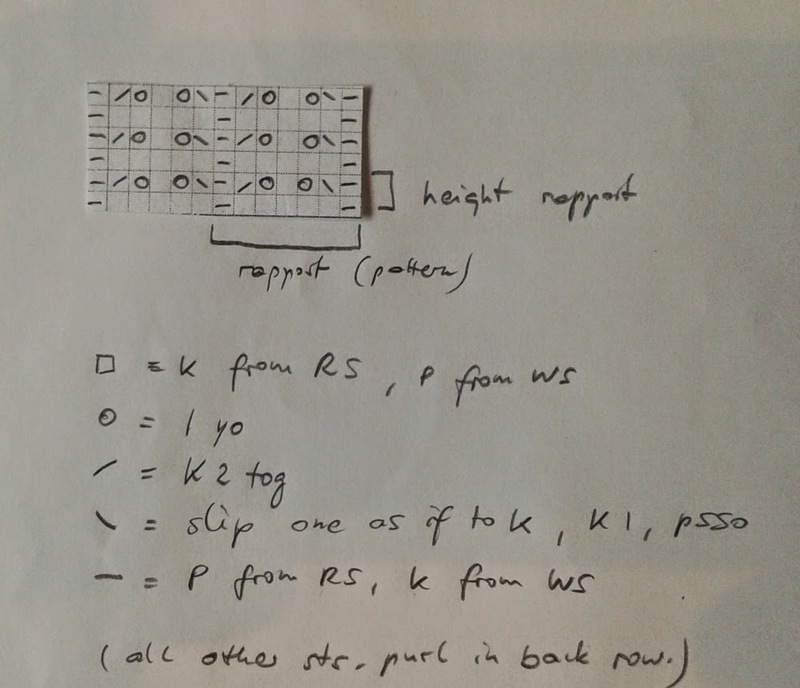 ( total height = 40 rapports ). 57 sts .1 row (= a back row) stockinette sts. (it appears in front as purl). 1 edge sts , then 9 x the pattern , 1 end loop . Every 6th row cast on1 sts on both sides. 1 x 6 sts , 1 x 13 sts. (total height = 17 rapports ). Close the shoulder seams , insert the sleeve, close the side seams. Around the neck crochet with a crochet hook number 3.5 approximately 100 single crochets. Work 3 rows in single crochets. The 4th row (= the last row) is crocheted in rsc. Iron the pullover very carefully. 1 Randmasche, dann 14 x den Musterrapport, 1 Endmasche. Den Höhenrapport 27 x stricken. 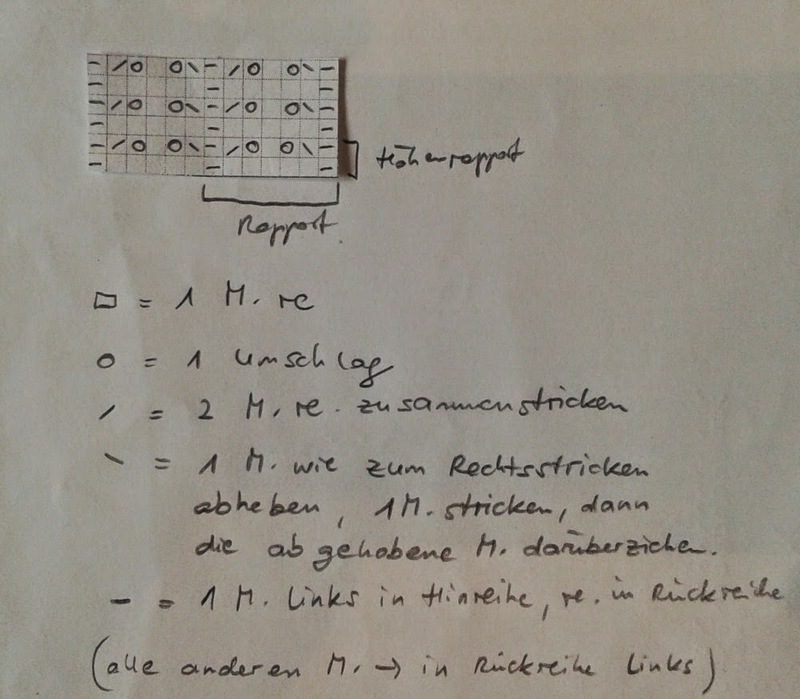 Für das Armloch wie folgt abnehmen: 1 x 3, 1 x 2, 1 x 2, 1 x 1 Maschen. Danach sind noch 75 Maschen auf der Stricknadel. 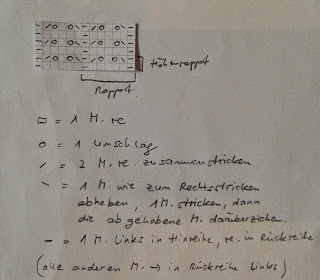 Nach 29 Höhenrapporten für den Halsausschnitt 1 x 22, 1 x 3 , 2 x 2, anschließend 1 x 1 Masche abketten, bis 20 Maschen für jede Schulter auf der Stricknadel sind. 1 Randmasche, dann 9 x den Musterrapport, 1 Endmasche. Jede 6. Reihe beidseitig 1 Masche zunehmen. Nach 8 Höhenrapporten (man hat jetzt 69 Maschen auf der Stricknadel) wie folgt für das Armloch abnehmen: 1 x 3, 1 x 2, 1 x 1 Masche. Danach in jeder Reihe 1 Masche, bis noch 25 Maschen auf der Stricknadel sind, dann 1 x 6 Maschen abnehmen, die verbleibenden 13 Maschen abketten. (insgesamt hat man danach 17 Höhenrapporte). Die Schulternähte schließen, die Ärmel einsetzen, die Seitennähte schließen. Für den Halsausschnitt mit einer Häkelnadel Nr. 3 ca. 100 feste Maschen häkeln. 3 Reihen feste Maschen arbeiten. Die 4. Reihe (= letzte Reihe) wird im Krebsstich gehäkelt. (man häkelt feste Maschen von links ach rechts).Sorgfältig und leicht bügeln. Turquoise is the summer colour!